When Hazel, the leader of a warren of rabbits, and his little brother Fiver arrive at a field of blood, Fiver predicts an apocalypse and that they need to flee. They decide to save as many of their fellow rabbits as they can, and 10 of them are able to escape. This group's adventure entails avoiding a farmer who is using the most plump bunnies for lard in his food. They travel for two days and reach a hillside known as "Watership Down." Fiver's prophesy of doom ended up being correct, as their old home is gassed soon after they leave. The rabbits set out on a crusade to help other animals. They care for a black gull until its injured wing heals. They free penned rabbits. Hazel gets shot but survives in a drain until Fiver rescues him. Later on, Hazel almost gets killed by a cat. Watership Down is no doubt a classic and is Penguin Books' best-selling novel ever. 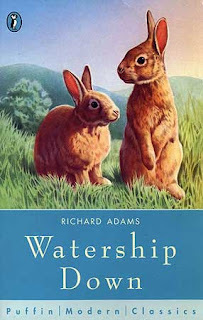 Written in 1972 by Richard Adams, the author never really wrote any other classic books. And this one is still not at the level of Animal Farm, George Orwell's superior and similarly-themed tale of animals rebelling against humans. they put this on lost! There was probably a serious uptick in readers of the book after the Lost reference. Funny that Sawyer was always reading in general, being such a scoundrel and all.